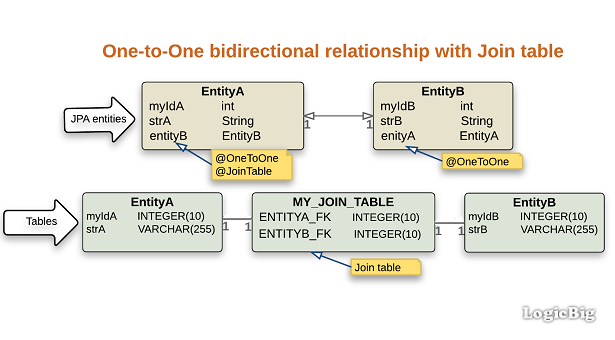 A quick overview of bidirectional one-to-one join table mapping strategy. By default, a bidirectional one-to-one association, populates the relationship in a foreign key column of the table that corresponds to the source entity. We can instead use an intermediate table to persist the foreign-key/primary-key mapping. To achieve that we have to use @JoinTable annotation on the source (owner) entity side. In the target entity, we still have to use @OneToOne with 'mappedBy' element.